New Korean Skincare in Town! Ginkgo Natural under the Korean cosmetic giant, Charmzone promises to nourish the skin, keeps it feeling fresh and lively. The key ingredients lies in gingko leaf extract, which is high in oxidative power to reveal skin that is bright, clear and lustrous. 11street, one of the largest e-malls in Malaysia, is proud to be the first in Southeast Asia to feature exclusively the range of Ginkgo Natural products to cater to the Malaysian market. As part of the partnership, 11street will feature Ginkgo Natural’s basic skincare range, which encompasses three steps – cleansing, toning and moisturizing. 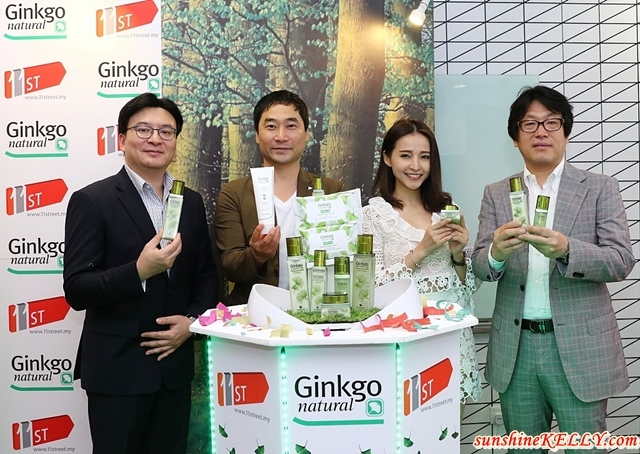 From left to right: Lee Yong Jin, Managing Director of CJ IMC for Southeast Asia; Bruce Lim, Vice President of Merchandising for 11street; Agnes Lim, Malaysian model and actress; and Lee Young In, Managing Director of Ginkgo Natural/Charmzone. Ginkgo Natural harnesses the anti-oxidative power of ginkgo leaves to nourish and protect skin against everyday stress and damaging environmental elements. The ECOCERT-certified Ginkgo Natural range is made up of 95% natural ingredients, and contains zero mineral oil components. This is the hero product and best seller of Gingko Natural. For the first step, Gingko Natural features the Cleansing Tissue for make-up removal that uses embossing technology develop its ultra-soft cloth that is gentle on the skin, yet effectively removes dead skin cells, deep cleanses pores and impurities. The Cleansing Foam is for double cleanse off residue make-up and is suitable for all skin types. The Ginkgo Natural Skin Toner helps tighten pores and balances skin pH after cleansing, to prepare it for the third step – moisturizing. Packed with powerful punch of 1000mg of gingko leaf extract to lock in moisture and promote skin repair and optimizing skin absorption for the next skincare step. The former leaves a light and lingering feeling on the skin, while brightening it up at the same time. The latter supplies skin with more moisture, yet making it feel light and fresh. The emulsion is light weight and provides moisture that lasts throughout the day. Rich in antioxidant to plump up the skin, thus preparing it for better absorption of moisturizer. 11street introduces special promotions for Ginkgo Natural products under 11street’s ‘Shop The World’ campaign, which runs from 1 March to 3 April 2017 with up to 65% discounts on Ginkgo Natural products and free shipping to West Malaysia. During the promotion period, these products will range from RM7 to RM119.97 with an additional exclusive 15% discount coupon available for download on the Ginkgo Natural promotion page on 11street.